New Details About NYC's Nordstrom Tower - Joe.My.God. New York Yimby has some new details about midtown’s coming Nordstrom Tower, which is now under construction. Permits for the tower have continued to shift slightly in recent months, but the documents YIMBY previously obtained indicated the building would have a roof height of 1,479 feet and a pinnacle height of 1,775 feet, which would make it the tallest residential tower on the planet. Final figures are likely to be within a hair of both numbers. Compared to the world’s tallest buildings, 217 West 57th Street would rank fifth if it were built today, standing almost 1,000 feet shorter than the Burj Khalifa in Dubai, and by 2018 it may not crack the global top ten. But its roof will be substantially taller than both One World Trade Center and Willis Tower. The most recent figures put 217 West 57th’s Spire one foot below the WTC’s 1,776-foot pinnacle. Despite this, the slight elevation of Midtown compared to the Financial District (a net gain of approximately 70 feet) will mean that 217 West 57th Street’s spire will actually rise approximately 1,850 feet above sea level. While the WTC may retain the title of NYC’s tallest by spire height, 217 West 57th’s relative prominence to most New Yorkers will actually be somewhat greater. 432 Park Avenue passed the WTC’s roof last year, and One Vanderbilt will likely do so in about 2017. 432 Park is currently regarded as somewhat tall relative to its surrounds, but the appearance of new buildings like 217 West 57th and 111 West 57th will quickly even out the disparities in the skyline, as will the rezoning of Midtown East, which may result in Manhattan’s tallest towers yet. The tower is due to be completed in 2018 and will host a massive Nordstrom store, a hotel, and several hundred condos. The penthouse is expected to feature the highest outdoor space in the city. 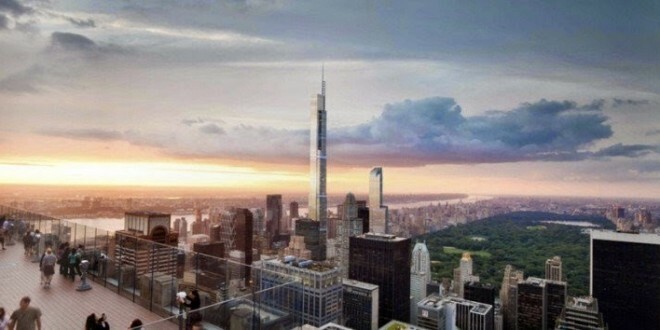 (The rendering above shows the 70th floor observation deck at Rockefeller Center.) Within five years or so the Empire State may not be among the ten tallest buildings in town. The Nordstrom Tower is #27 in the “coming soon” rendering below. Embiggen for a huge version.